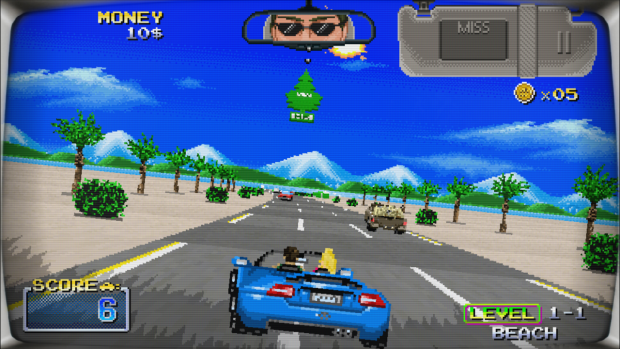 Out Run really was ahead of its time. Released over 30 years ago, Yu Suzuki tapped into the racing market like never before, with a sit-down car-like arcade cabinet and an exploration-based concept. In Out Run the objective wasn’t to really “finish first" despite the time limit mechanic. It was all about the journey, providing choices for where to go by way of forked roads, leading to multiple playthroughs, and even other choices that weren’t typical at the time, like radio stations. The game broke my preconceived notions of what the medium could do at the time as a young runt, and still stands as one of Sega’s crowning achievements. It was a magical experience stepping inside one of those cabinets, and although Highway Runners ($0.99) doesn’t really hit all of the same notes, it’s a nice little homage to a bygone era. I was pretty surprised at how to the point Highway Runners was. From the title screen to an actual run is roughly 10 seconds — you just have to sift through a quick tutorial before you’re on your way. It’s short and sweet, and teaches players about the accelerometer movement and tap-to-drift system, as well as the ability to “graze" other cars for points and your quest to collect coins and continue credits. (Also worth noting is the game was promptly updated following its release with a new touch controls option, for those who aren’t big fans of tilt control.) There’s no lengthy “trial" mode, menus to sift through, or gates of any kind, you just rev up your engine and go. It’s as arcadey as they come, with tons of bits of cash littered around random areas, lots of breakable objects, and breakable crowds (though without the gruesomeness of say, Carmageddon). I really dig the camera tilt when moving the device, as it’s just subtle enough to make an impact, but isn’t so off-putting that it ruins a run. Dodging is great too, as any given vehicle provides an opportunity to get a new high score, though it’s not necessary to painstakingly do it every time. If you want, it’s perfectly fine to center in on collectibles and focus on staying alive. Highway Runners tries something a little different with its core modes, by linking its difficulty to rear view window ornaments. Initially you’ll have your standard setting with a decent amount of cars to avoid, but after acquiring $1,000 you can turn on the “Zen" mode (with an appropriate yin-yang dangling above), that alleviates traffic. It makes it a lot easier to drive through all 15 environments, which include cityscapes and deserts alongside of the starting beach zone. Yep, the “choose your own adventure" dichotomy returns. Yet, “Runners" is kind of an accurate moniker here, as it really does feel like a “run" in a typical endless game, even if there’s a finish line in sight. Players will start over from the first stage if they crash three times (which, to be fair, is pretty lenient), lest they spend some of their cash to continue. And for $1.99 you’re getting the whole shebang, devoid of microtransactions that are designed to get you to see that game over screen more often and spend cash. As a result the game never feels skewed towards that end, even if building up cash can feel a little grindy (earning enough for any given unlock will take you 10-20 runs each). The unlocks are actually worth it though, with two levels, more rear view pendants, and day, evening, and night cycles to sift through. Again, without an IAP system in place, they actually do feel like unlocks, though I wish there was a more open-ended way to earn them outside of grinding for cash. It’s a weird juxtaposition in terms of design philosophies when it sort of acts like a typical freemium game, but really isn’t. 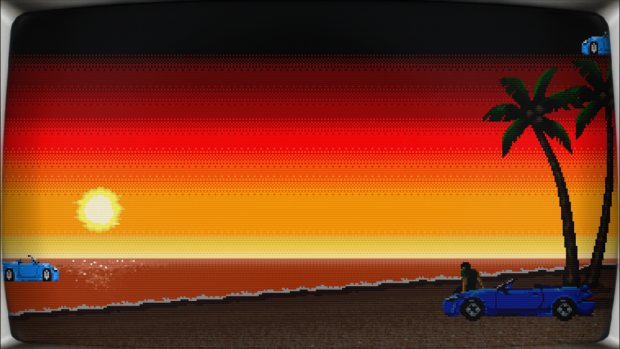 If you’re into the idea of playing a driving game solo that isn’t about perfecting your run to get first place, Highway Runners might be for you. It’s the kind of game you can turn on and go for a quick coin run in, or get lost for an hour trying to acquire a new level. It’s aesthetics are retro enough to draw in a crowd, but not overly cloying to the point where it feels like it’s a knockoff. It definitely has room for improvement, but it hits a sweet spot for sure (it even has scanlines and a monitor overlay effect!). A lot of love was poured into the creation of this project, and it shows.